Royal Air Force Charitable Trust Enterprises - News: Reds Final Display Before USA Tour! 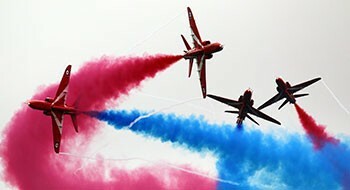 Home » The Airshow » Visiting the Show » Latest News » News: Reds Final Display Before USA Tour! Reds Final Display Before USA Tour! We're pleased to announce that the Red Arrows will return to the Air Tattoo this year. They will have their last public display at the show before they fly to North America for the Western Hawk 19 Tour! You may have already heard the news, as it was announced earlier this week by the Minister of Defence, in his statement about the Red Arrows Tour of the USA and Canada. This isn't our usual way of announcing aircraft but we talked to our friends at the Red Arrows and they're happy for us to confirm their attendance at this year's show. Taking to the skies on all three days, the display team will once again delight crowds at RAF Fairford with their thrilling routines. We now just need your help to make sure we give them a great send off before they jet off across the pond!